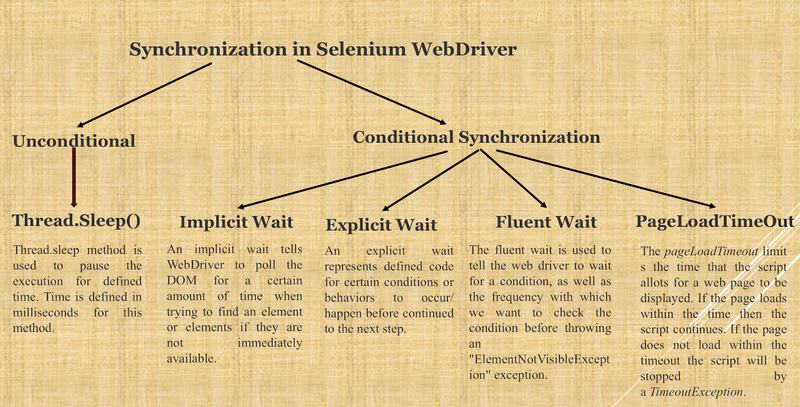 4.Conditional and Unconditional Synchronization in Selenium WebDriver. •It is a mechanism which involves more than one components to work parallel with Each other. •Both these components will have their own speed. We should write our scripts in such a way that both the components should move with same and desired speed, so that we will not encounter "Element Not Found" errors which will consume time again in debugging. •It is a process of coordinating or matching two or more activities/devices/processes in time. •Process of matching the speed of AUT(Application under test) & Test tool in order to get proper execution. •During the test execution Test tool gives instructions one by one with same speed, but AUT takes less time for some steps execution and more time for some steps execution, in order to keep them in sync then Synchronization is required. •Whenever any step required time more than Synchronization time for execution, then Synchronization is required. •Thread.sleep method is used to pause the execution for defined time. Time is defined in milliseconds for this method. •During Implicit wait if the Web Driver cannot find it immediately because of its availability, it will keep polling the DOM to get the element. •If the element is not available within the specified Time an NoSuchElementException will be raised. •The default setting is zero. •Once we set a time, the Web Driver waits for the period of the WebDriver object instance. •There can be instance when a particular element takes more than a minute to load. •In that case you definitely not like to set a huge time to Implicit wait, as if you do this your browser will going to wait for the same time for every element. •To avoid that situation you can simply put a separate time on the required element only. •By following this your browser implicit wait time would be short for every element and it would be large for specific element. •Let’s say you have an element which sometime appears in just 1 second and some time it takes minutes to appear. •In that case it is better to use fluent wait, as this will try to find element again and again until it find it or until the final timer runs out. •The pageLoadTimeout limits the time that the script allots for a web page to be displayed. •If the page loads within the time then the script continues. •If the page does not load within the timeout the script will be stopped by a TimeoutException. // for its presence once every 5 seconds. Ni, It actually polls internally until the element is found in the html DOM within the given time. This is the correct behavior of implicit wait. When you say its waits until the element is found in the html DOM . So, Does it check for all the web elements ? and what is the difference b/w the Implicit and pageloadtimeout wait? Naveen sir, can you please clarify if by default ImpliciteWait try to poll on all WebElements on every page? If we use it where driver initialization takes place in our framework. However, I am unable to click on the selected element in dropdown. Also my id value,in the span class changes for every search. Request to please help me out.